Workers received a terrifying message last week, one far more bone-chilling than Halloween ghouls or Freddie Krueger. 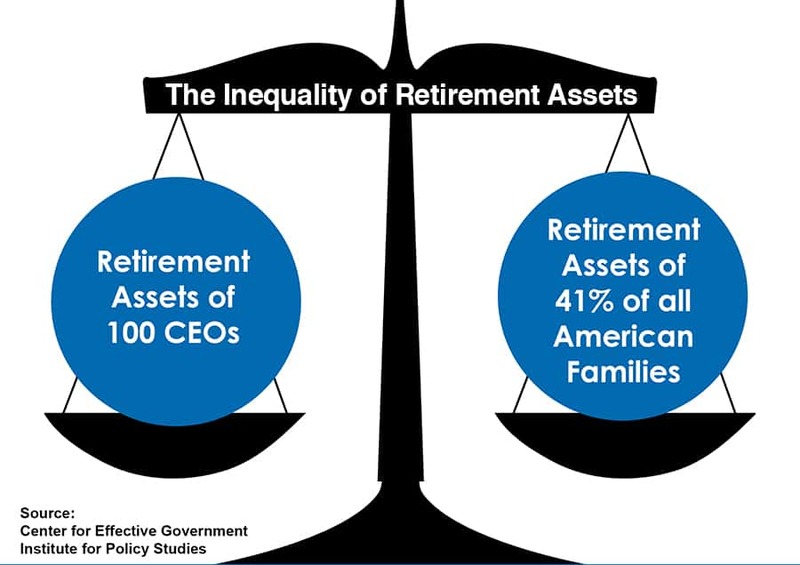 It was this: Retirement security is only for CEOs, not for workers. Two sources delivered this frightening news. One was a dozen Republican presidential candidates insisting during last week’s debate that Social Security be slashed. The other was a new report detailing how corporations killed worker pension plans while simultaneously gilding CEO retirement accounts. There’s a simple explanation for this ill-treatment of the vast majority. It results from the persistent demand by CEOs and other 1 percenters that all wealth get deposited in their pockets. That means grotesquely fat paychecks, perks and pensions for them and no raises and no retirement for workers whose labor creates corporate profits. That means CEOs and 1 percenters paying Social Security taxes at a much lower rate than workers do, hobbling the program. The uber-wealthy get away with this because politicians, particularly Republicans, are their indentured servants. Billionaires bankroll their campaigns and get exactly what they want in return. Federal rules facilitate CEOs amassing pensions worth hundreds of millions of dollars. Workers can’t contribute more than $24,000 a year to their 401(k) retirement plans, but corporations can stash unlimited cash in special CEO retirement accounts – and then get a tax break for doing it! A report issued last week by the Center for Effective Government and the Institute for Policy Studies details the disparity in CEO and worker pension treatment. Titled “A Tale of Two Retirements,” it notes that the 100 largest CEO retirement funds are worth a combined $4.9 billion. That equals the entire old-age savings of 41 percent of all American families. These 100 CEOs have awarded themselves the same amount of pension money that 116 million Americans have scrimped and saved for retirement. Among those 100 high rollers, the guy with the most mammoth retirement account is David Novak, who moved this year from CEO of YUM Brands to executive chairman. YUM, which owns the low-wage restaurant chains Taco Bell, Pizza Hut and KFC, handed Novak a $234 million pension. For Novak, that’s a pension check totaling $1.3 million every month until the day he dies. A million a month! In the meantime, YUM stopped providing pensions to new hires in 2001 and owes its workers’ pension fund $310 million. This is typical corporate misconduct. YUM poured $234 million into Novak’s retirement fund. But the corporation just can’t seem to find the $310 million in owes the pension account for thousands of its dedicated workers. The guy whose pension ranks number five on the list is John H. Hammergren, CEO of McKesson. The corporation has handed him a $145.5 million pension fund, which means he can collect $819,243 a month. Though that’s less than what YUM gave Novak, McKesson bested YUM in one area. It denied pensions to new hires beginning in 1996, five years before YUM did. Hammergren, whose average annual pay is $50 million, was a new hire at McKesson in 1996. Though he wasn’t named CEO until years later, clearly, he got himself a special exemption from that no-pension for new hires rule. CEOs don’t follow the rules. Then there’s Marilyn Hewson, the female CEO with the largest pension account. Lockheed Martin deposited $60 million in her retirement fund, enough to give her a monthly check totaling $341,649. Hewson’s corporation eliminated pensions for newly hired salaried workers in 2006 and newly hired union workers in 2012. Then, last year, it announced that it would begin freezing the pensions of 48,000 salaried workers starting in 2016. That’s retirement luxury for CEO Marilyn Hewson; retirement poverty for Lockheed Martin workers. While corporations stash more and more in the accounts of CEOs like Hewson, they’ve slashed more and more from workers, like those whose labor makes profits for Lockheed Martin. In the early 1990s, 35 percent of private sector workers received a defined benefit pension plan at work. Now it’s 18 percent. Today, nearly half of all workers have no access at all to any retirement plan at work, no defined benefit pension, no 401(k). Those with a 401(k) have paltry savings, an average of $18,433, only enough to provide a retirement check of $104 a month – somewhat less than Novak’s $1.3 million a month. Because so many corporations have decided only CEOs need pensions, a huge portion of the nation’s elderly relies heavily on Social Security. For 24 percent of the approximately 40 million senior citizens who receive Social Security, it is the sole source of retirement income. It amounts to $1,335 a month, about $16,000 a year, barely enough to pay for food, shelter and health care. Yet Republicans running for president want to cut it. Or they want Americans to work longer before getting it. Sen. Ted Cruz, Sen. Rand Paul and Gov. Chris Christie have all said Americans should be forced to work past age 65. They’re demanding 66-year-old roofers and carpenters and iron workers continue to carry heavy loads and climb scaffolds and ladders. They’re just fine with 66-year-old tire builders and steelworkers and refinery workers being forced to stand all day operating body-battering machines. At the debate last week, Sen. Marco Rubio said he’d protect Social Security for his mother but not for younger people. Former Hewlett-Packard CEO Carly Fiorina, who left the company with a $40 million golden parachute when she was fired, said the government should do nothing to help workers. Sure. She was fine with the government giving Hewlett-Packard tax breaks that padded her pay and pension. Now that she’s got her $40 million, she thinks the government should do absolutely nothing for working people’s pensions or for the 40 million Americans who depend on Social Security. The obvious fix for Social Security is to require the wealthy to pay the tax on all of their income, just as middle class and low-wage workers do. As it is now, the rich pay the tax only on the first $118,500 they earn. They don’t pay a cent of the tax on the rest. No matter how many millions they pull down. The obvious fix for pensions is to require corporations to provide for workers the same kind of benefits they gift wrap for top executives and to end the exclusive tax breaks given CEO pensions. Fiorina and other fat-cat CEOs believe they’re special and shouldn’t have to follow the same rules or pay the same taxes as workers. American workers will continue to suffer retirement insecurity until they stop electing politicians who are indentured servants to 1 percenters and CEOs like Fiorina.